Polyalkylene Glycols are formed when one or more alkylene oxides are reacted with an alcohol. Polyalkylene glycol based oils are commonly used in metalworking fluids, quenching fluids, chain oils, food-grade lubricants, gear oils, and as lubricants in HFC type gas compressor and hydraulics equipment. Due to the high oxygen content of polyalkylene glycols, they are unique among synthetic lubricants. They are exceptionally clean as lubricants that allow their use where petroleum products would build sludges and tars. Polyalkylene glycols was one of an essential chemicals for industrial purpose discovered during the World War II. After the development of polyalkylene glycols, the low pour point and high viscosity indices used as an indicative for their application in developing all-weather, heavy duty brake fluids. Polyalkylene glycol lubricants are the only ones that provide water solubility. Polyalkylene glycols are developed by polymerization of epoxides with a starter consisting of an alcohol and smaller amounts of its metal alkoxide, usually sodium or potassium salt. Polyalkylene glycols were first developed for the navy for use in military aircraft. 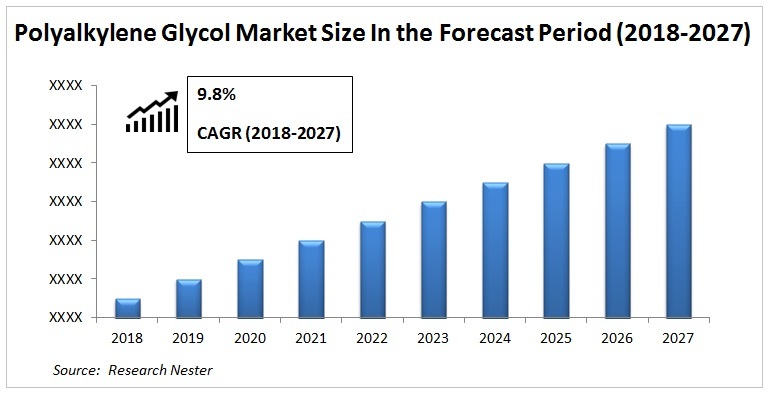 The application of polyalkylene glycol in various end-user industries has increased since which is estimated to propel the market over the forecast period. Polyalkylene Glycol Market is anticipated to record a CAGR of 9.8% over the forecast period. The polyalkylene glycol market is estimated to value at USD 5 billion at the end of the forecast period. Many multi-national companies are concentrating towards new product advances in polyalkylene glycol. Moreover, the many advantageous properties of polyalkylene glycol are exploited in the field of automobiles, adhesive and electronics now and then. New uses for polyalkylene glycol derivatives are discovered on regular basis which is expected to drive the polyalkylene glycol market rapidly. Currently the global polyalkylene glycol market is observing vibrant growth owing to increasing demand of polyurethane foams in the market. Advances in automobile industry in the past few years and growing technological explorations are projected to drive polyalkylene glycol market besides the wide range of functions of polyalkylene glycol in an immense range of advances such as wind turbine lubricants and tunnel boring during the forecast period. 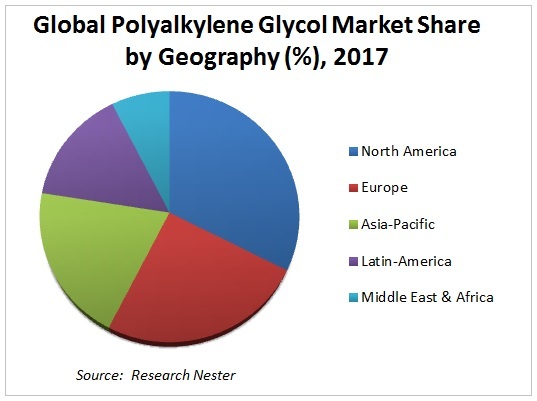 On the basis of regional platform, global Polyalkylene Glycol market is segmented into five major regions including North America, Europe, Asia Pacific, Latin America and Middle East & Africa region. As a precursor to polyurethane foam production in various end-user industries, North America is panned to observe substantial polyalkylene glycol market growth on account of rising polyalkylene glycol usage in building and construction, decoration and sculpting market. North America is expected to be followed by Europe in terms of consumption due to expanding polyalkylene glycol requirements in adhesive and electronic industries. The rising demand for polyalkylene glycol and its by-products for various processes in automotive, textiles and footwear industries are expected to drive the market rapid over the forecast period. The growing R&D activity associated to polyalkylene glycol is further expected to increase the market growth owing to the discovery of new applications of it on regular basis along with their low tendency to form carbon deposits, is very essential to environment sustainability. Properties of polyalkylene glycol such as low degree of toxicity, high-temperature applications, water solubility, residue resistance property, and prominent energy efficiency as well as lower molecular weight polyalkylene glycols readily biodegradability are predicted to behave as essential factors in the substantial growth of the polyalkylene glycol market across the globe. Additionally, the increased methoxy-PEG (MPEG) consumption in the production of polycarboxylate ethers and their use as concrete additives in construction and building industry is estimated to increase the demand for polyalkylene glycol on account of escalating construction industry across the globe over the forecast period. However, introduction of substitute compounds in the market at cheaper rates in the future can result in restraining the global polyalkylene glycol market growth during the forecast period.